Clicky user Chris Nanney developed a plugin for Chrome using our API. The icon that appears in your plugin bar shows you how many visitors are on your web site right now, and clicking it will show the equivalent of "the basics" dashboard module. From here you can choose to view a summary of any site in your account, and select from a few basic date ranges to give you a quick summary of site activity. You can add as many sites to it as you want. We love it when one of our users comes out of the blue with something like this. If you're a developer and have made something awesome with our API, or plan to, let us know. We may very well blog about it. This is great... thank you! 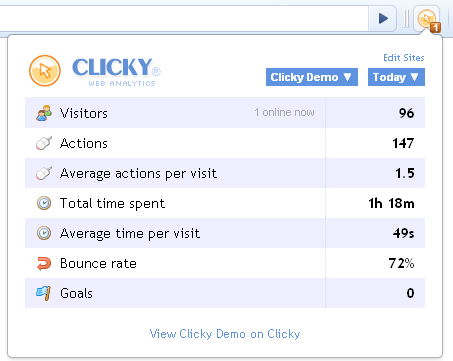 I use Clicky to track traffic to my blog http://unseenbattle.net and it works great. Chris is awesome. I am going to be using this for a long long time. Yea ..... Works like a charm. Is not working for me..bad site ID, yet it is what Clicky shows. that is SiteKey say it is bad. Ok works now...had to run it three times to get it registered. Very handy indeed. Thanks again!